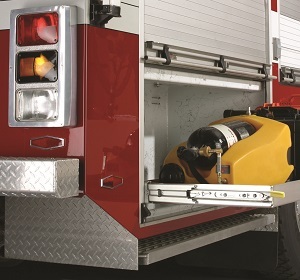 When it comes to utility and emergency vehicles, Accuride International, a leading manufacturer of drawer slides and movement solutions, believes sliding hardware performance can be mission critical. Emergency and service situations demand quick and reliable access to supplies and equipment, as well as safe and secure transport of materials when vehicles are on the move. Thats why Accuride's collection of slides designed for mobile applications provide features such as hold in detents, locking mechanisms, and self closing. A few of the products from this collection include the 3832 Heavy Duty Self Closing slide, model 9308 with lock-in and lock-out features, and the CB-Hand Locking Handle Kit, which can be added to most of Accurides heavy duty slide products. The Accuride mobile slide collection addresses access and storage requirements for a wide variety of applications found in this particular market niche. Utility and emergency vehicles must carry everything from screwdrivers to respirators to be prepared for day-to-day business. In addition to drawers, trays, and shelves, pullout vertical panels are used to carry low profile tools, wire, rope, and hoses. Deep bins and drawers are used to store bulk supplies and materials. Many vehicles also serve as a mobile office. Service or sales paperwork, invoicing, route planning, and other activities are often managed on the road. The Accuride slide collection provides access to drawers or trays for supplies, files, or literature. These slides also enable drivers to position a work surface or access a laptop docking station or other electronic devices. In addition to carrying equipment, platforms or trays mounted on Accuride slides can extend and lock into position to serve as on-site work surfaces. Other items suitable for pullout platforms or trays for storage include batteries, generators, or communication and diagnostic devices.